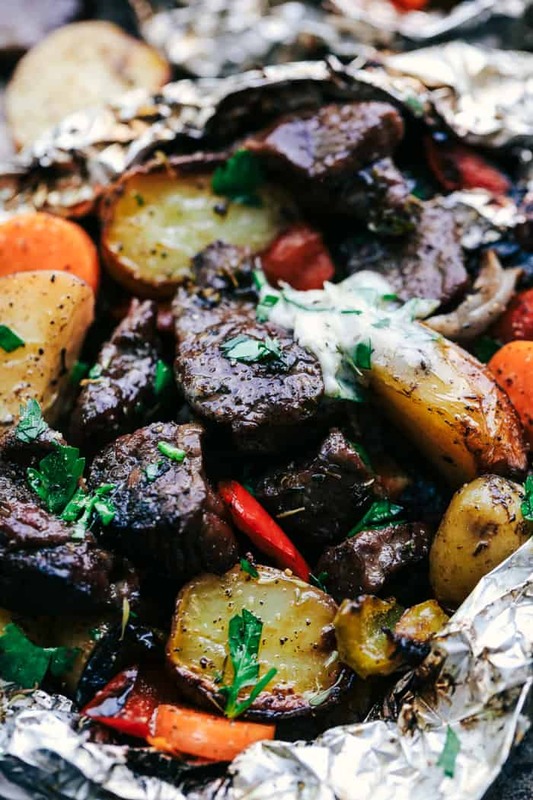 Butter Garlic Herb Steak Foil Packets have melt in your mouth beef with hearty veggies that are grilled to perfection with butter that has garlic and herbs inside. This is one amazing meal that you don’t want to miss out on! We love that this weekend is a long weekend and I love planning for Memorial Day. We love having a big BBQ followed by a fire and s’mores. 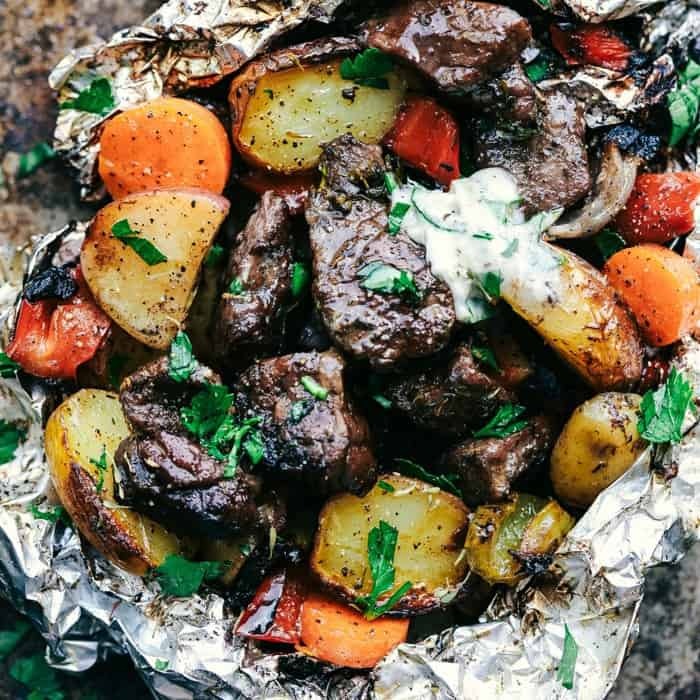 Foil packets are one of my all time favorite things to grill. It is the perfect meal in one. When I was thinking about how to switch up our normal foil packets I wanted to include steak for my steak loving son. And what better thing to include with them is a butter with garlic and herbs? It just melts while it cooks and creates the most tender and perfect steak and veggies. We absolutely loved these foil packets! Easily one of our favorites. I love how the grill gives the slightly charred edges. These were full of amazing flavor and I loved the combination of the herbs. You guys have got to grill these this summer. They are fantastic and will become a new favorite at your house as well! 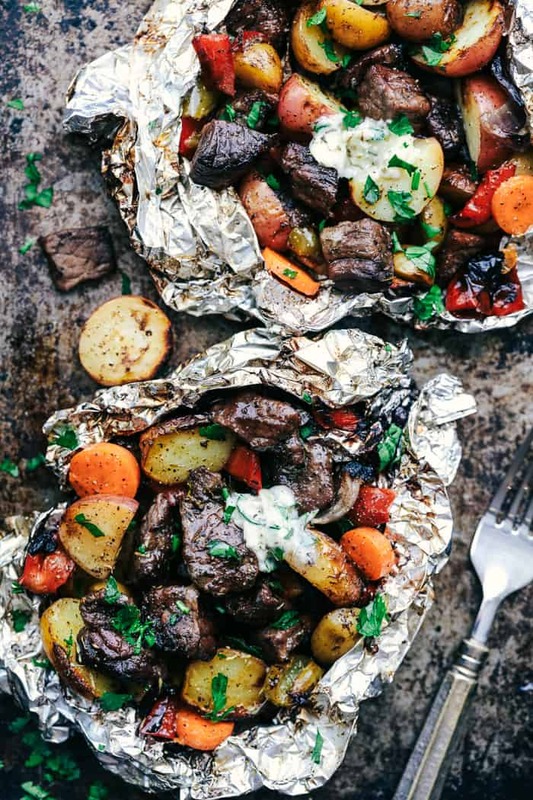 Butter Garlic Herb Steak Foil Packets have melt in your mouth beef with hearty veggies that are grilled to perfection with butter that has garlic and herbs inside. This is one amazing meal that you don't want to miss out on! In a medium sized bowl add the red potatoes, carrots, bell peppers, and red onion. Add salt and pepper and toss with olive oil. Place four 18x12-inch pieces of heavy aluminum foil on counter. Evenly place vegetable mixture on each piece of foil. Top vegetables with steak. To make the garlic herb butter: In a small bowl add the butter, parsley, garlic, rosemary, thyme, salt and pepper. Divide evenly and place on top of the steak. Double fold top and ends of each piece of foil, leaving space for steam to gather. Place packets on the grill and coverl. Grill 15 minutes or until steak is cooked through and veggies are tender. Carefully open packets and serve. *I didn't sear the beef before hand and cooked this meal on the grill in tin foil. I do however flip the packets over onto the flame at the very end to give the beef and veggies a slight char. NO GRILL, HOW LONG IN MY OVEN ???? You can bake it on a cookies sheet at 400* for 20 minites checking it depending on your choice of cooked meat. I am having company tomorrow and want to make this. My grill, however, just broke. What would be the time and temp in the oven? Thanks! Looks delicious. Could I do it In the oven instead of the grill and without meat?? How long would I bake it I the oven without the meat? it doesnt mention temperature of grill. or if cooked in oven.. temperature please. I will do 400 and see. 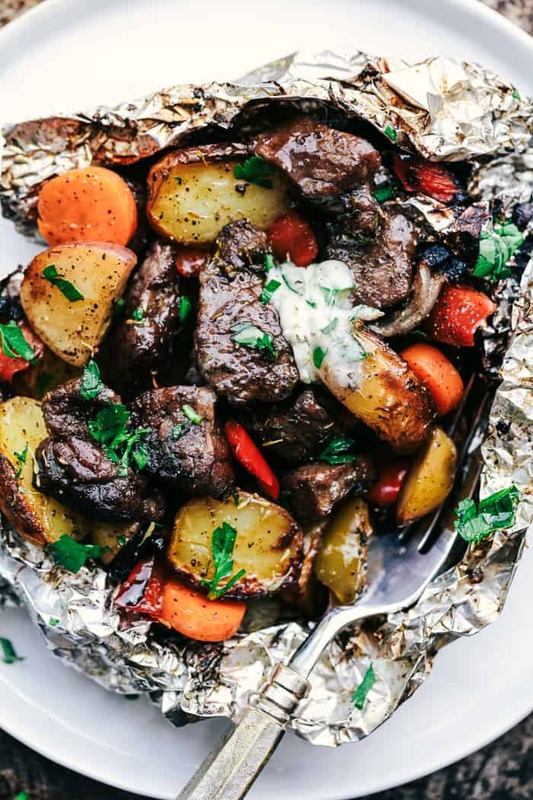 A suggestion: replace your foil with Parchment Paper. It will work the same way but illuminates the aluminum. Hi Alyssa, meant to send my comments moooooonths ago regarding this recipe and simply forgot, my apologies! I’m here now though and must tell you this recipe is OUTSTANDING!! My husband and I just love it! Meat is perfect, juicy and so tasty, especially with the fresh herbs added. The potatoes and vegetables are simply the best! I added some hunks of blue cheese to the herb butter mixture and it was delicious!! Thank so much for a wonderful dish!! I made this last night in the oven. Was so good! The whole family loved it. Thanks for the recipe!! This is in the oven in my cast iron skillet as we speak – smells amazing!!!! High heat. 10 min. Flip 10 min. Precook veggies a little.